Working as a designer since 2007, and specializing in infographic, typography and illustration. Work experience includes in-house design work, in particular with organizations which are promoting social issues such as ecological responsibility, human rights and equality. In 2011 the series ‘The Berliners’ was created. The series was consisting of ready made toys integrated with custom made items and prints all behind a plastic bubble. The aim was to create contemporary toy packs, transforming everyday characters into action figures. After gaining popularity with the ‘Berliners’, Dorit realized that there is no limit to the items that can be boxed, and the ‘In a box’ series was created. Check them out! Dorit Bialer is a designer and artist. 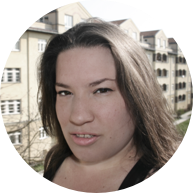 Born and raised in Israel and based in Berlin since 2009. She received her Bachelor of Design from ‘Bezalel’ Art & Design academy, Israel in 2009. 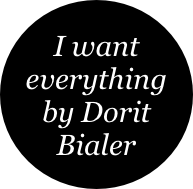 In 2011 Dorit started ‘I WANT EVERYTHING’ which embodies her design and art work with the aim to not completely distinguish between the two.